SCVHistory.com LW3348 | Law Enforcement | LASD Rehabilitation Division Transfer Bus, ~1950s-60s. 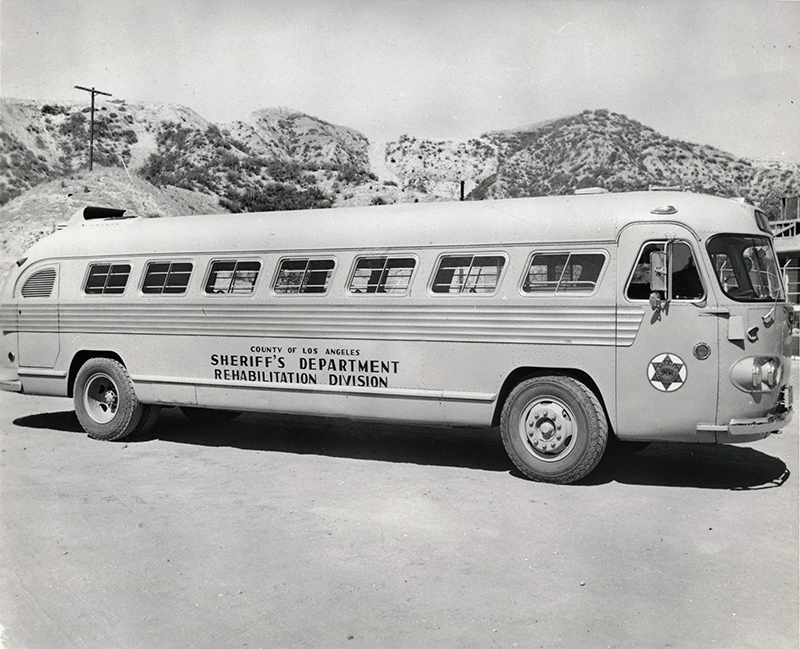 Los Angeles County Sheriff's Department Rehabilitation Division bus, used to transfer low-level inmates to and from detention facilities for alcohol and drug addicts, probably late 1950s or early 1960s. The location is unidentifed. It might be the Acton Rehabilitation Center (Acton Rehab), which opened in 1961; or Munz-Mendenhall (aka Lake Hughes Rehab), a combination probation-rehabilitation facility that opened in 1959. Mira Loma handled rehab inmates when it opened in Lancaster in 1953, but the landscape is wrong for Mira Loma. Located in Los Angeles County and in part of the Angeles National Forest, Acton Conservation Camp or "Camp 11" was originally utilized as a "Road Camp" where workers lived responsible for the construction of the 14 Freeway. The camp was later occupied by the Los Angeles County Sheriff's Department used to house County Inmates. In the early 1970s the Los Angeles County Fire (LACO) Department moved into the camp, named "Camp 1" at that time. "Camp 1" was used to house and train non-incarcerated Fire Control Laborers with four "Hand" Crews and one "Heli tack" crew that responded to wild land/brush fire until the early 1980s when a new agreement with California Department of Corrections & Rehabilitation (CDCR) was reached. Since that time, Acton Conservation Camp #11 has been a cooperative partnership between LACO Fire Department and CDCR. Camp 11 has proudly served the citizens of Los Angeles County and the State of California. The Camp 11 Fire Crews respond to wild land/brush fires and other natural disasters from the Mexico border in the south to the Oregon border in the north. Camp 11 is one of the busiest Fire Camps in the State, averaging over 500 fire responses a year. LW3348: 9600 dpi jpeg from copy print purchased 2018 by Leon Worden.